First, from Jennifer Pharr Davis, who for years held the AT supported through hike record, when someone asked her if what she was doing was fun. Her reply, “This is better than fun!” Great answer. I hope to remember it when hiking a long uphill in freezing rain. I may not necessarily believe it at that moment, but maybe if I say it often enough….. But most of the time hiking like this is better than fun, especially when you’ve clawed your way up to the top of a mountain, and you can look down not just on the path you’ve hiked, the surround valleys and towns, but even look down on surrounding mountains and, if conditions are right, look down on clouds. Unbelievable. Better than fun. I swore I wasn’t going to ever hint to another hiker that they were having fun wrong, that they were hiking wrong. HYOH and all that. But I did come up on one hiker the first day who was struggling up a hill. And her pack was huge. I’ve seen a lot of big packs out here, 45, 55 pounds and more. Her sleeping bag was outside her oversized backpack because there was no room for it inside. It was big. I violated my guidelines: “You seem to be struggling with that big pack; packing heavy.” She said “Lots of people have said that to me.” “You can get a lot of great guidance at Mountain Crossing” I so helpfully offered. “They’ve told me that, too” she said. Well, I don’t want to have someone tell me I’m having fun wrong. So I’m making the pledge anew. 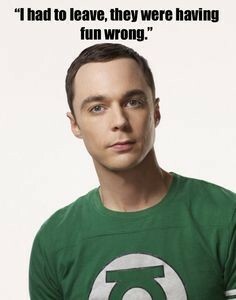 But if I see another person struggling under a monster pack, with six things hanging on the outside, I may have to work to stifle my inner Sheldon.